This notable home has appeared in “Lethal Weapon 2” where it was the headquarters for a South African drug ring. Mel Gibson famously demolishes this landmark house in the climax of the film. 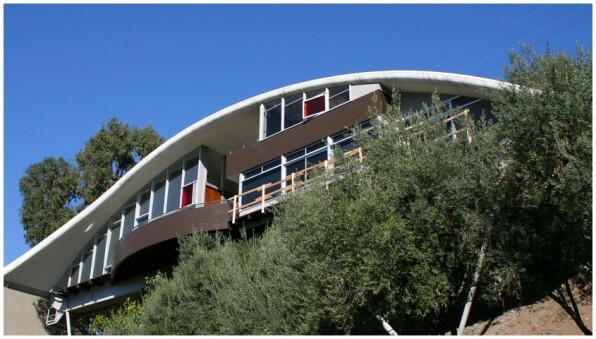 This house was designed by John Lautner for Russ Garcia, an arranger for Stan Kenton and built between 1958 – 1962. it is 2,400 square feet divided between two structures under a single sweeping arched roof. The property was recently renovated by Marmol Radziner and decorated by Darren Brown. This entry was posted on Wednesday, November 17th, 2010 at 9:48 pm	and is filed under architecture & design, notable homes. You can follow any responses to this entry through the RSS 2.0 feed.